On a cold January day, the wind funnels down Creston Avenue in the Morris Heights neighborhood of South Bronx like a river through a canyon. Buildings seem slightly closer to the street here, and the tall towers loom over the narrow street and sidewalk. A couple of teenage girls walk down the street, laughing and shoving each other. Some new construction gleams incongruently on one side of the street, but most of the other buildings on this block are much older, with a foregone elegance still barely visible in the stonework and tiles. Yet inside these buildings residents complain of deteriorating living conditions. On a survey tenant after tenant writes of mice and cockroach infestations, peeling paint, broken toilets, inconsistent heat and hot water, and a front door with no lock. “The hallways smell like urine” writes one. Tenant Johannie Burdier says the building was poorly maintained, dirty, and sometimes simply scary. She tells of a former building manager who, she says, took money from people in exchange for access to sell drugs from inside the building. A resident for seven years, Burdier lives in the building with her aunt and her eleven year old daughter. She says for much of her time there they were lucky if there was heat or hot water in the apartment. These complaints are more than an inconvenience. Constant anxiety, prolonged exposure to molds, unchecked vermin and inadequate heat and hot water – all these things make people sick. The vast majority of people living in failed buildings are low-income and uninsured. When they get sick, they go to the hospital. And the city is left holding the bill. A new pilot program, created by housing advocates and healthcare workers, aims to increase awareness of the public health costs resulting from distressed, overleveraged buildings. The program sends healthcare providers and social workers into buildings on the brink of receivership to identify and treat housing-related illnesses. The team hopes to help tenants, compile data on the health outcomes of living in buildings in poor condition, and eventually determine the actual cost to the city. She explains that when banks and owners fail to care for buildings, the costs of that failing often shows up in the medical bills of the people who live in those buildings, and that these tend to be low-income people without healthcare, so that cost is ultimately absorbed by taxpayers and the city. Until now, she says, there has been anecdotal evidence that people in certain buildings are getting sick, but a study would provide the first quantifiable direct connection. The project has gone out to buildings four times since Labor Day, and plans to do more outings this year. Members of the Committee of Interns and Residents of SEIU Healthcare, collaborating with the Family Medicine Department at Bronx Lebanon Hospital, the Pediatric Department at Jacobi Medical Center, Urban Homestead Assistance Board (UHAB), and Workforce Housing, created the Doctors’ House Visit Program as part of a larger community outreach program, the Healthy Bronx Initiative. 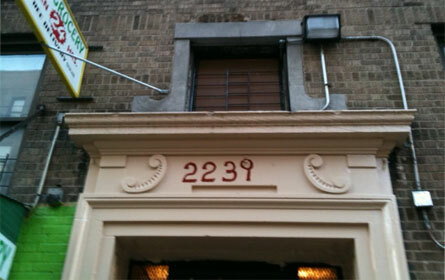 The most recent visit was in November, to a building at 2239 and 2241 Creston Avenue in the Bronx. One attending physicians and three resident physicians went to the building, accompanied by a social worker and an administrator with Bronx Lebanon. They visited with residents in twenty-one of the building’s fifty-four apartments. The team had three specific goals: to help bring relief to tenants suffering health consequences from their building; to gather data for a Bronx-Lebanon study of the correlation between poor housing and chronic health problem; and to give tenants information on their rights regarding the condition of their building. Levy says that as of July 2011, 2239 Creston had 431 outstanding code violations, while 2241 had 431 violations. The former owners, Victor and Alan Fein, originally bought the Creston buildings along with several others in the Bronx on a loan from Astoria Federal Savings Bank. Three of those projects – including the Creston --have since gone into foreclosure. A Village Voice article from March 2010 names the brothers as owners of three Bronx properties listed as being among the city’s worst. The article says the Feins have operated since the mid-'90s under various company names including Cherokee Partners and Apache Properties. Workforce Housing Advisors, an affordable housing development firm led by ex-city developers, is working on a public-private financing deal to purchase and renovate the buildings. Orlando Moronta, the building super, has lived in the building since 1998. He says the Feins barely contacted him in the decade he owned the building. He tells of unscrupulous former building managers who rented out apartments while telling the owner they were vacant, in order to pocket the money, and rented to people engaged in drug activity. Since the building went into foreclosure, Moronta says things have actually improved slightly. He says the number of violations is down and there have been recent mold remediation efforts and lead paint removal. Tenant Johannie Burdier said she tried avenues to address problems in the building. She tells of taking her complaints directly to the Fein brothers’ office on Bronx Park East, where she says a relative of the brothers would dismiss her complaints and call her a liar. Fein Property Management did not respond to a request for comment, other than to say that relative was no longer working there. Calling 311 didn’t help either. Burdier the city would investigate and order the brothers to make the repairs, and then when no repairs were made, would send out workers. But she said often the repairs were never made, because the landlord or an employee would always show up and order the city workers off of the premises. One of the main health effects that doctors point to as resulting from hazardous living conditions is pediatric asthma. Pediatric asthma is particularly an issue in the Bronx, where the rate of death from asthma is nearly three times higher than the national average and hospitalization rates are five times higher, according to a report from the Wagner School at NYU. While most studies of asthma in the Bronx have focused on traffic, doctors on the visits saw a direct correlation between mold and asthma. Dr. Kerone Thomas, a second year family medicine resident at Bronx-Lebanon who was part of the visit, says living conditions are a major factor in developing childhood asthma. “Based on the observations we made of mold in the apartments and residents with asthma, there seems to be a strong correlation.” She said in many of the apartments the visiting health workers saw evidence of mold, leaky pipes, and rodents. While over-leveraged buildings are not the only buildings in poor enough condition to cause housing-related illnesses, they do present a unique situation for the city. Banks and lenders are generally regulated by the federal government and the state, so there is often not a lot that local governments can do to address blighted or neglected buildings in city neighborhoods. Cities can, through the Housing Preservation Department, enforce building code. The Department is required to identify the worst two hundred buildings in the city for the Alternative Enforcement Program (AEP), which attempts to hold landlords accountable for violations. If a building is found in violation and does not comply with the AEP order to fix the problems, HPD can send out a contractor to make the repairs and bill the owner for the cost. If the owner does not pay, HPD can have a lien placed on the property. In 2010 a law introduced by City Council Speaker Chris Quinn was passed that added asthma to one of the list of violations that made a building eligible for the AEP. The Creston buildings were added to the AEP list in 2010. While building code enforcement is an important step, some problems with enforcement remain. Though HPD can put a lien on a property, UHAB tenant organizer Dan Desloover says some of those liens are not foreclosable." Identifying housing-related illnesses and applying health code violations to the retinue of charges against a bad landlord may not make much of a difference. Dina Levy points out that for owners unconcerned with breaking the law, the threat of breaking further laws may not carry much weight. “For those people you need other tools. If you’re willing to be on the wrong side of code violations, are you going to be willing to be on the wrong side of health violations? Probably.” She says from a public policy perspective the goal will have to be to think creatively about enforcement measures beyond violations. There are some 80,000 failed housing units up for receivership in New York City. The problem can be partly attributed to outdated policies. After the financial collapse of the seventies and the subsequent abandonment of areas of the city, new housing policy was set in place to spur reinvestment in neighborhoods. The policy was successful – lots were rehabilitated, and neighborhoods restored. By the nineties, the policies designed to entice banks into investing in these neighborhoods were just icing on an already-sweet cake. Developers and investors, savvy at accessing investment credits, purchased buildings in gentrifying marginalized neighborhoods and converted them to market rate as the neighborhood became wealthier. By 2005, the success of these gambles means that multi-family apartment buildings with rent restricted units are fetching enormous sums, despite the inability of the rent rolls to pay back the debt. Banks, intending to immediately resell those mortgages in pieces on the secondary market as mortgage-backed securities, didn’t worry too much about their due diligence on the loan. And then the market collapsed. Building owners suddenly found that even at market rate, rent rolls could not support the mortgage debt. Property taxes and operating costs such as water and sewer continued to increase, and soon investors found themselves sitting on properties worth less than their mortgage. Many stopped putting any more money into what now looked like a bad investment, and the buildings fell into disrepair. When an owner defaults, the bank holding the mortgage cannot force the owner to reinvest in the building or even pay their debt. All they can do is foreclose on the property. The properties go into receivership. The owner gets to keep the money they made. The bank keeps the profits from the mortgage-backed securities they sold. In receivership these already neglected buildings deteriorate further. Receivers may do some limited maintenance and upkeep, but do not usually undertake major repairs. Meanwhile the losers in this game, besides those whose pensions and investments lost money over those securities, are the tenants. Holes in the walls, rats, unsafe electrical wiring, bad heat, flaking paint, all the crumblings of failure compound to create health hazards for the very people those walls should be protecting. Questions remain about what the appropriate policy response should be. Using health code to go after negligent owners seems likely to encounter many of the problems that using building code does. Without harsher enforcement, those already on the wrong side of the law seem likely to stay there. In addition, the levels of government most affected are not the ones with the most regulatory power. While it is cities and local governments that pay for the health-care costs of low-income renters suffering building-related problems, they have very little power over the banks and lending companies that are underwriting mortgages. Update: An earlier version of this story incorrectly stated that HPD liens are not enforceable. Liens placed by HPD through the Emergency Repair Program and the Alternative Enforcement Program are forecloseable as long as they total $1,000 or more and accrued after January 1, 2006.